A friend of mine sent me a link to your blog with my son in mind, and I wanted to share a little of him with you. My boy, Caemon, considered himself a master chef at the age of two. In fact, he was in love with cooking from his first year on because he would ride around on my back in the Ergo while I cooked. 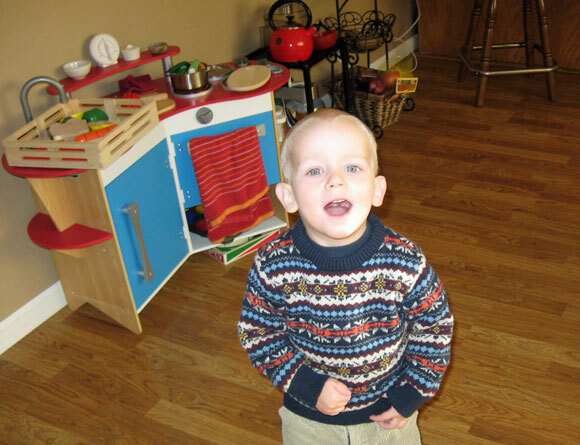 Once he walked and stood, he would stand on a chair at the counter helping me make most of the food we ate, and his very favorite toys were his kitchen and all of his kitchen gear. 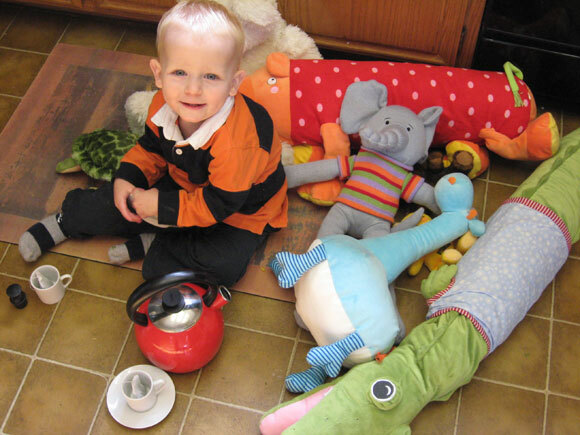 One of his first favorite “toys” was a tea kettle. He was in love with kitchen appliances and tools, and I would often find myself missing something only to find it in his little kitchen. We rarely watched television, but when we did, we watched cooking shows, and he would spot something he wanted to make, and promptly say, “I want to make THAT!” and would run to his little kitchen to whip up a new concoction. 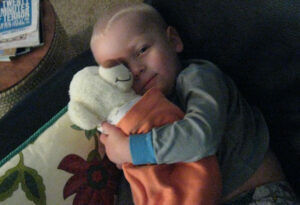 But he also loved his stuffed animals. He had a doll, which he wasn’t crazy about, but his bears were dear friends with whom he regularly had tea parties, or as is evidenced in the photo, he swaddled like babies and kissed and hugged. You have probably noticed that I am using the past tense. 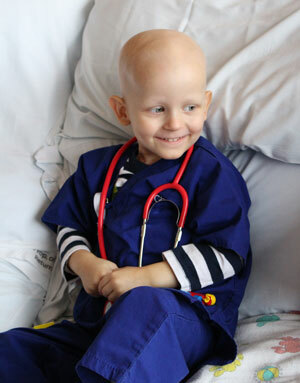 Caemon was diagnosed with leukemia just shy of his third birthday in August of last year. We lost him to the disease in February of this year. We don’t know who Caemon would have been as an adult. I can tell you that I’m certain many people assumed he’d be some sort of overly sensitive guy, maybe gay — and maybe they would blame that on being raised by two moms or maybe on the types of toys he played with (but man, that boy also loved dirt and trucks). What I can say is that at the age of three, when we entered a world of living in the hospital all the time, people were amazed at what a well-rounded kid he was, at how nurturing he was, and at how well he was able to adapt to his situation. 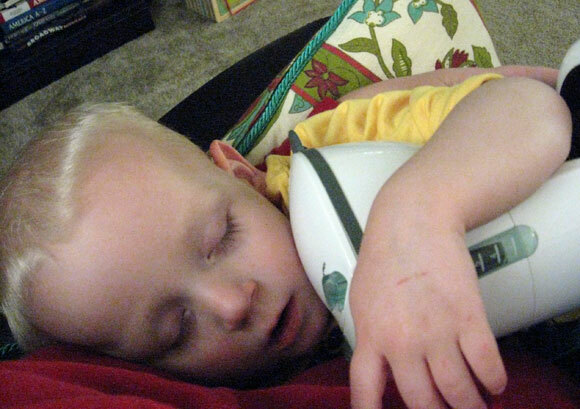 He went from loving kitchen play to loving nurse play, and he learned everything he could about being a nurse. People would come into his hospital room to find him wearing a stethoscope and scrubs, playing with medical supplies, and ask if he was a doctor. “No,” he would reply. “I’m Nurse Caemon.” When anyone would try to ask why he didn’t want to be a doctor, I would shoot daggers with my eyes. He wanted to be a nurse because the nurses got the coolest “toys” and they were interacting with their patients, nurturing them, caring for their needs, talking to them and not about them. Of course he wanted to be a nurse. He also had some really amazing male nurses, but to him, if people were wearing bright blue scrubs (what the pediatric nurses wore), they were superheroes. I suppose this is an incredibly long way of saying I so wholeheartedly appreciate what you are doing because toys should indeed be just toys, things with which kids play, from which they learn about the world. Gendering toys is ultimately harmful to our children, as is gendering professions. So, yes, we let our boy play with any kind of toy he could imagine. We let him play with real things too because all of it helped build his curiosity, his imagination, his sense of self, and he was an incredible little soul. Anyway, thank you for letting me share this. I know my son would approve. Copyright for this blog post remains with the author. It should not be reproduced in whole or part without permission. This is really beautiful – thank you for sharing it. So sorry for your loss. Thank you for sharing with us who your little boy was and the things he loved. Just beautiful. Time after time it is reinforced to me that the most practical and enduring lessons of compassion and how to live with joy, come from watching children. Thank you for sharing the beautiful spirit of your son. He is a beautiful little boy, I am so sorry for your loss. Thank you for sharing your story.